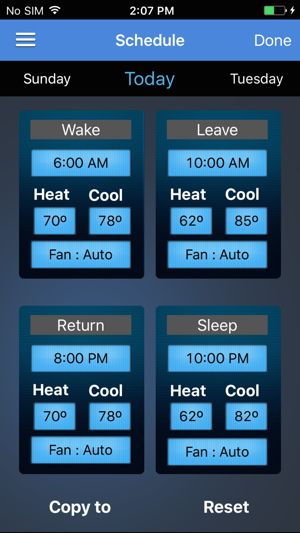 The design of the Aprilaire Wi-Fi Thermostat App provides users information when and where it’s needed. Options can be selected that automatically control the indoor environment based on the needs of each individual consumer’s home. When events occur in the home that affect the indoor air quality, the Aprilaire exclusive Event-Based™ control options make managing and improving the air quality simple. 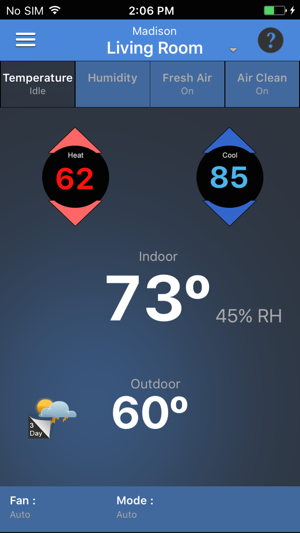 The Aprilaire Wi-Fi Thermostat App allows you to control temperature and also all aspects of your home’s comfort from across the living room or across the country. The app is compatible with all Aprilaire Wi-Fi Thermostats and features an intuitive, user-friendly design and usability. Please visit my.aprilaire.com or call 1-800-545-2219 if you have any questions or need assistance with setting up your Aprilaire Wi-Fi thermostat on the App. 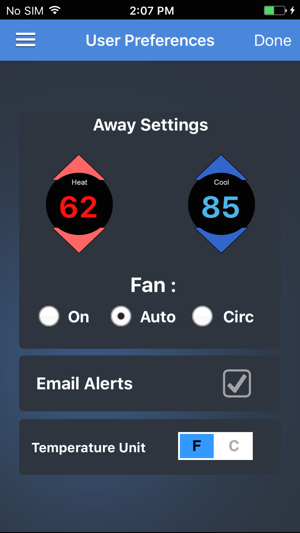 •	Instantly confirm status (on, off, idle) of all IAQ and HVAC equipment from the home screen. •	Event-Based™ control of Air Cleaning and Fresh Air allow for instant control over situations affecting health and comfort, such as increased allergy and dust levels, odors and stagnant air. o	Know what’s going on in your house even if you’re not home with alerts about high or low temperatures, low or high humidity, equipment failure and outdoor allergy information. This app is really buggy. The state of our address gets changed all the time. Today, all fields (name, address) have gibberish text. We changed them multiple times and though every tome it says it’s saved properly, it goes back to the gibberish text again. They also base hour by time zone which doesn’t work for us as we live in a state that doesn’t have daylight savings time. We have also set up the cleaning mode on each thermostat and it seems that the app doesn’t save the selection that we’ve made. I am finding alternatives of this product. Very disappointed!!! Update: 10 months later, still using this thermostat. App is still buggy; state always go back to AL (why AL? No clue). Gets notification that wifi is disconnected all the time, even on the thermostat itself. No improvement whatsoever! Still requesting a new system from our builder because apparently after 10 months, twice the AC company came to fix it (which there is nothing wrong with the AC system itself), Aprilaire rep came and tried to fix it; nothing works because the product simply doesn’t work...period. So this thermostat came with the new build home that we purchased. At first we were looking forward to having a quality thermostat with an app to back it up. BOY were we surprised. If I had to truly compare the quality, or lack there of, of this app/thermostat to something that anyone would understand I would use waxing.... I know sounds crazy at first but please hear me out. So this thermostat and app look good. Then you realize how we really got to that amazing smooth skill feel and look.... Aprilaire has managed to hold you down and perform a full body wax using duck tape. Yup imagine it if you can duck take on your most sensitive areas and it just getting ripped off over and over again till it’s bare as can be. That’s what it’s like using this stupid app and thermostat. Great Potential But Needs Some Modern Updates!!! I have an aprilaire system in my new home for about two months and I love the technology it has. This app however would be 100x better if it had auto away features using your phones gps location to determine that you are away from home... this feature would save a lot of $$$ and would make this system competitive with the Nest! Also, this app looks like it hasn’t been updated in a very long time. 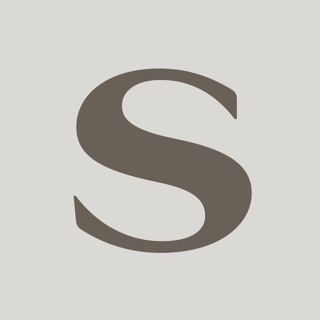 I have an iPhone X and the app doesn’t look very well on the screen and it is not the most intuitive and user friendly... I challenge Aprilaire to make tweaks like this before I switch to a competitor.